Two 14’’ (356mm) separate straps hold round objects up to 15” (381mm) in diameter. Holds equipment measuring up to 28” (711mm) in linear distance. 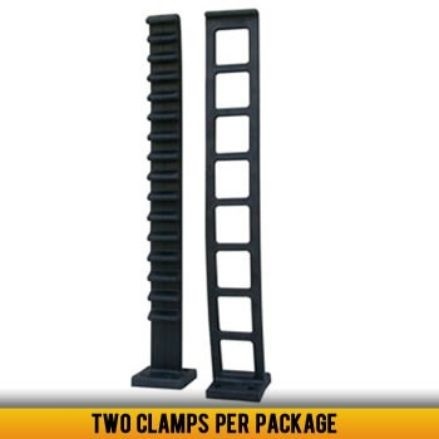 Each clamp supports a safe working load of 150lbs. (68 kilos) with a break-strength of 300lbs. (176 kilos). Two clamps support 300lbs with a break-strength of 600lbs (272 kilos). Each half of the clamp mounts with four #10 screws or bolts.